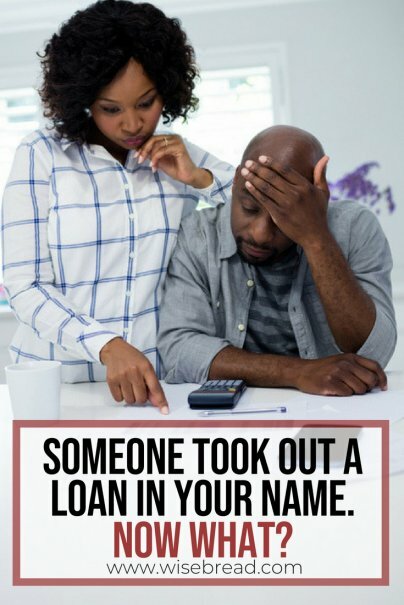 Home » Personal Finance » Someone Took Out a Loan in Your Name. Now What? Identity theft wears many different faces. From credit cards to student loans, thieves can open different forms of credit in your name and just like that, destroy your credit history and financial standing. If this happens to you, getting the situation fixed can be difficult and time-consuming. But you can set things right. If someone took out a loan in your name, it's important to take action right away to prevent further damage to your credit. Follow these steps to protect yourself and get rid of the fraudulent accounts. If someone took out a loan or opened a credit card in your name, contact the lender or credit card company directly to notify them of the fraudulent account and to have it removed from your credit report. For credit cards and even personal loans, the problem can usually be resolved quickly. When it comes to student loans, identity theft can have huge consequences for the victim. Failure to pay a student loan can result in wage garnishment, a suspended license, or the government seizing your tax refund — so it's critical that you cut any fraudulent activity off at the pass and get the loans discharged quickly. In general, you'll need to contact the lender who issued the student loan and provide them with a police report. The lender will also ask you to complete an identity theft report. While your application for discharge is under review, you aren't held responsible for payments. If you have private student loans, the process is similar. Each lender has their own process for handling student loan identity theft. However, you typically will be asked to submit a police report as proof, and the lender will do an investigation. When you find evidence of fraudulent activity, you need to dispute the errors with each of the three credit reporting agencies: Experian, Equifax, and TransUnion. You should contact each one and submit evidence, such as your police report or a letter from the lender acknowledging the occurrence of identity theft. Once the credit reporting bureau has that information, they can remove the accounts from your credit history. In some cases, it might be a good idea to freeze your credit. With a credit freeze, creditors cannot view your credit report or issue you new credit unless you remove the freeze.